There's not many people out there that can get away with wearing three belts. It's a great look so we're glad Captain Jack Sparrow is here to inspire us all. He does everything a little more intensely than anyone else. Got a ring? Good ol' Jack has two on each finger. Think your dreadlock game is pretty cool? Well, are your dreads perfectly weathered, beaded, and wrapped in waxed strings? No? We don't know how he does it but for all of his traveling and shenanigans Jack seems to have devoted plenty of time to his eclectic style. 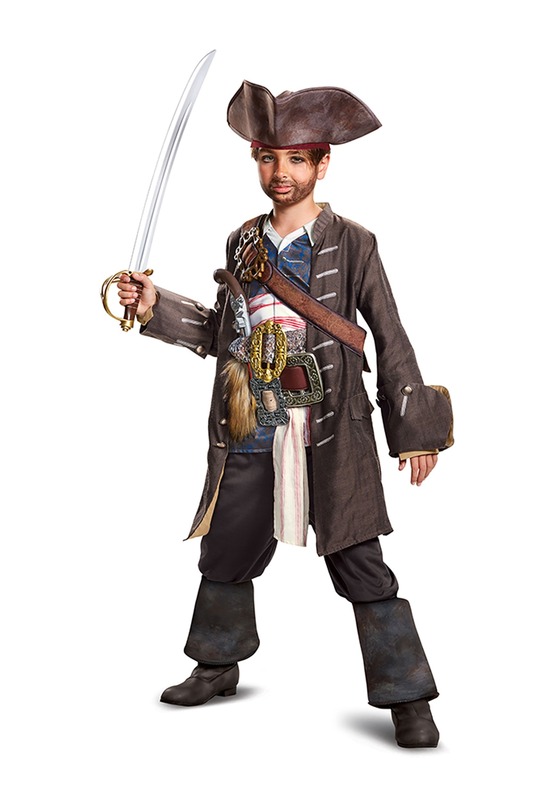 While you wouldn't ever want your kid to emulate the weathered and confused Captain (we doubt anyone else has his brand of luck) he can still channel Jack's distinct look but if you want to do it right that means going all out! Jack never knows what's going to happen so he's got to keep his belongings on him at all times. So while we admire his style that extra ring on his index finger could be used to buy supplies or, let's be honest, it could be used to buy some rum. And those belts? You can be sure they aren't only defining his waistline, that's where Jack keeps his maps and other valuables. Whether your buccaneer child is dressing up for Halloween or an epic ocean voyage this deluxe costume will make him feel like he really is everyone's favorite pirate. The costume features a coat with oversized cuffs and buttons, leathery looking boot covers, and a rich, eclectic base layer. Finish it off with the bandolier belt and a pirate hat and he'll be ready for the high seas. This year "trick-or-treat" isn't going to cut it. More like, "Give us the candy, savvy? ".